You are currently browsing the category archive for the ‘Wax’ category. I had been posting about the Jasper Johns show at the Broad Museum for a while, encouraging anyone able to get there to go see this excellent retrospective in Los Angeles. I’d had it on my calendar for over a year and yet somehow still hadn’t made plans to go. One morning I woke up and decided enough was enough. I called my travel buddy Kimberly and told her I wasn’t having nearly enough fun lately and proposed we make this happen. She was all in. Thank goodness for friends who love a spontaneous travel opportunity! Last year Kimberly traveled with me to paint in Hawaii, so we could already imagine having a great time in LA. After a few false starts we got our flights and were on our way. The show, called Something Resembling Truth, did not disappoint. I didn’t realize just how many works there would be and was excited to discover each new room in the exhibit. This is a detail of one of Johns encaustic paintings of numbers, a portion of 5. I love the movement, layering and texture going on here. Sometimes my students bristle when I suggest that what they’re trying to do isn’t best done in encaustic and maybe they should consider another medium. This show was a perfect visual representation of this. Since I’m most familiar with his encaustic work, I was happily surprised at how many mediums Mr. Johns has worked in throughout his career. At one point I was looking a a huge painting and thinking about how talented he is in making encaustic look like aluminum and then I realized it WAS aluminum. From then on I read every tag and was excited to find paintings, sculpture and prints in many different media. One of my favorites was his work in ink on plastic (above) and it left me thinking that I’ll have to give that a try. In this painting you stare at the flag on top for a few seconds then look at the rectangle below to see the afterimage of a red, white and blue flag. We also got to see Yayoi Kusama’s Infinity Mirrored Room thanks to our AirBnB host’s knowledge of the Broad Museum at Downtown Los Angeles. It was incredible, even at only 45 seconds per person! There was a smaller installation by here that you looked into instead of stepping into, but it was no less impressive. This trip is just what I needed to break out of my routine and get inspired again. I’m so glad I went! 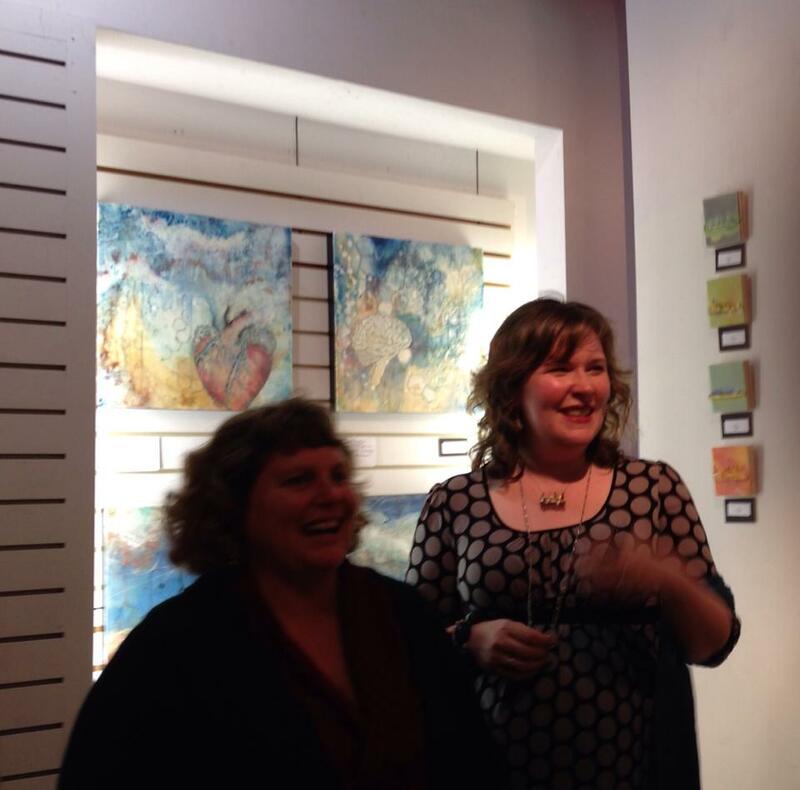 Linda Robertson is a painter and the author of the Embracing Encaustic book series. 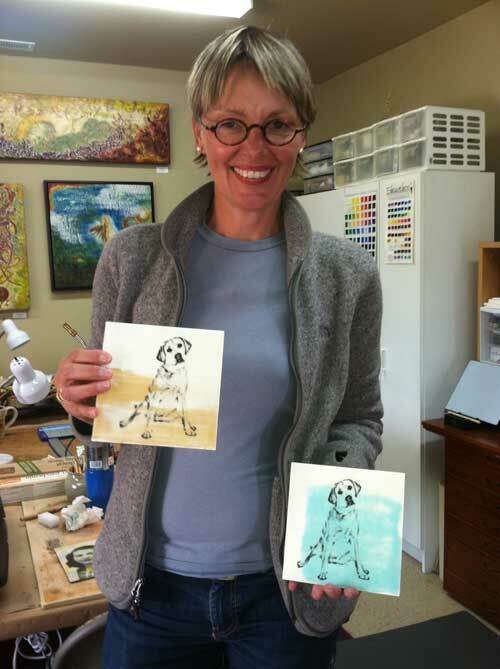 She offers live encaustic workshops in her Portland, Oregon studio as well as online encaustic classes. Paint with me in 2018! Every year I hear from students who want to take my encaustic workshops but either live too far away to fly in for just one or two days or prefer a more immersive environment where they can learn many techniques in a short time. With this in mind. I offer 5-day intensive workshops that combine some of my most popular classes with some brand new techniques that will keep you creating new work for years to come. Wax Week: Mix it Up! I’ve also opened registration for some of my 2018 single day classes. I only accept 4 – 6 students per class so we’ll have plenty of time to work together, and all supplies are included for most classes. Look for classes in Collage, Mixing Media, Wax Scrolls, Shellac and even Cold Wax & Oil (pictured at right). Looking for a community to create with on a regular basis? Check out my open studio classes for more experienced artists. View my web site for more options. I hope to see you soon! Just like everyone, some of my paintings resonate more with me than others. For me there’s something really special about Gather the Wind (36 x 49 in, encaustic and mixed media by Linda Robertson). It’s not just getting the technique just right, though that was extremely satisfying. I think it was more about being able to really capture the feeling I wanted to paint, not simply the shapes and colors. It’s one of my latest, but it’s already in a new home with one of my regular collectors. In fact, we moved one of my other paintings into her bedroom to make room for this one. (Now that’s a good day!) I had to share this photo of it in pace. Look at those walls! It’s a match made in heaven, and my collector seems to agree. Last Wax Scrolls Class of 2017! I love capturing the translucency of light in my paintings, but it’s even easier when working with wax and paper. The most dramatic way I’ve found to show this off is with my wax scrolls. There are just a few spots left in my last Colorful Wax Scrolls class of the year! Join me on Saturday, July 15, from 10 am – 4 pm in my private Portland, Oregon studio. Join me to create panels of paper and wax that are thin enough for natural light to penetrate, filling your space with energy and movement. In using paper we’ll trade some durability for dynamism, but wait until you see the result! If you keep them indoors they will last for many years, but you can still decorate your garden with them on special occasions. Every year I hear from more artists who are combining their travel plans with learning new art techniques. A couple of years ago I had people from 4 different countries in one of my classes, and since I only take 6 students at a time that’s pretty impressive! This year in addition to my five-day Wax Week intensive workshops, I’m also offering a few two- and three-day Wax Weekend sessions that focus on a particular theme including Luminous Landscapes, Photo Encaustic and my brand-new Secret Messages class. One of the most exciting things about working with encaustic are the unusual textures you can add to your paintings, so for this year’s Wax Week class I’m offering something new called Textured Landscapes. It’s a radical extension of my shorter Luminous Landscapes class. This 5-day intensive workshop combines some of my most popular classes with some brand new techniques that will keep you creating new work for years to come. In this class we’ll focus on creating Textured Landscapes using encaustic with a wide variety of materials including textured gesso, watercolor, pigment sticks, and photo transfers. We’ll use whatever media we need to create your vision, and working in small groups in my studio makes that possible. I hope you’ll join me in Oregon soon! For the past several weeks I’ve been distracted by our political turmoil, spending much more time outside my studio making my voice heard. Democracy can be messy and exhausting and I definitely need a break. More specifically I need an ART break. Maybe you do too? A few days ago I realized there’s a quick way I can help — by making my classes more accessible. So I’ve reduced the prices on all of my online encaustic classes! Each purchase gives you a full year of immediate access to the class videos, with the ability to watch them as many times as you’d like and work at your own pace. So go on, dig in. Now you can try something new for less while “washing away the dust.” And don’t forget to breathe. Linda Robertson is a painter and the author of the Embracing Encaustic Book series and she offers live encaustic workshops in her Portland, Oregon studio as well as online encaustic classes. I’ve taught encaustic workshops for many years using pancake griddles as the hot palettes, so I’ve become pretty opinionated about the type I like. I have a wonderful R&F Paints heated palette which I love, but since most students won’t be able to get that right away I like to teach with what they’re likely to have at home. 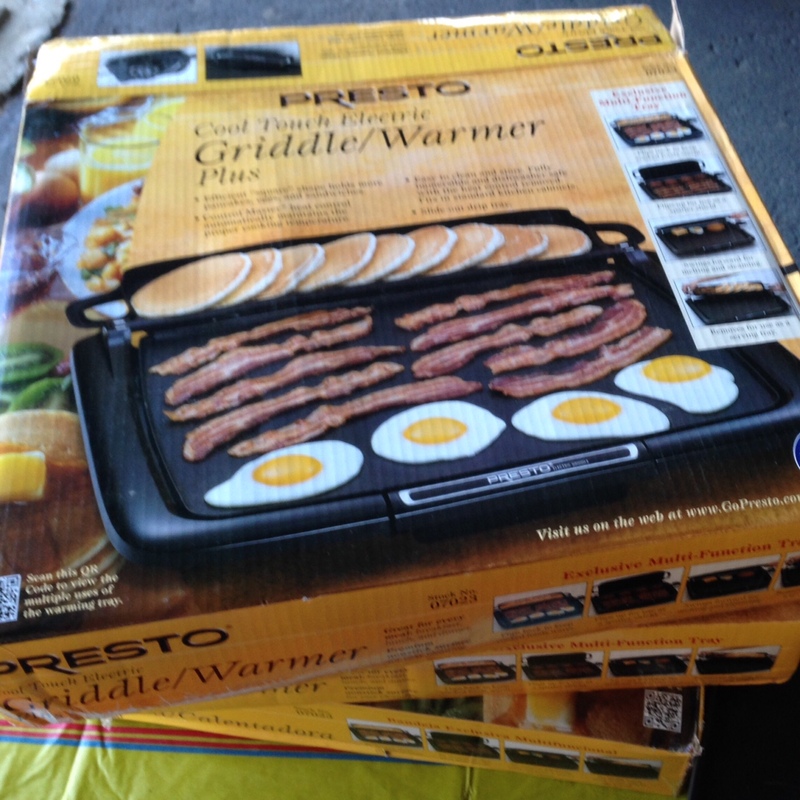 My favorite griddle brands are Rival and Presto because they last for years and offer fairly even heat which is important when painting with wax. I was almost tempted this time by another brand offering a white ceramic surface which would be great for mixing colors, but the reviews were not terrific, specifically mentioning uneven heat. So off I went to get my new griddles. It was a pretty funny trip because you get some strange looks at the store when you buy pancake griddles in bulk! I was disappointed not to find the type I love but then I realized I had stumbled upon something even better: a square griddle (easier to reach everything if you’re shorter like me or can’t stand while you paint) with a tiny drainage area (which keeps any wax you’re mixing on the palette from falling into the drain) and a warming tray attachment that can be removed and replaced with a wooden dowel to create a handy paintbrush holder. I’ve just replaced all of my griddles with this style for my upcoming classes, so I’m excited to try them out! Linda Robertson is the author of the Embracing Encaustic Book series and she offers live encaustic workshops in her Portland, Oregon studio as well as online encaustic classes. $20 off for a Really Happy New Year! Here’s wishing you all a happy, healthy and creative new year! To help you with the creative part use the promo code below to get $20 OFF any (or all) of my online encaustic classes. Taking classes online gives you the benefit of watching the videos as many times as you need to in order to feel comfortable trying it yourself. I offer several different classes including Painting & Texture, Encaustic & Collage, Stencils, Wax Transfers, and Shellac. Each class page has a free bonus video as well as a video excerpt from the actual class, so I encourage you to view those videos even if you don’t take the class. Just go to http://www.RobertsonWorkshops.com and click on the link of the class you want to take. At checkout enter “NewYear20” where it says “apply promo code” and enjoy! (Offer Expires 1/5/2015. Good for the “rent all” option to purchase a full class, not for individual lessons. This can’t be applied to previous registrations and cannot be redeemed for cash.) FEEL FREE TO SHARE THIS WITH FRIENDS! Get Out of Your Studio! Many artists need time alone in order to focus enough to get their work done. While I consider myself very sociable, even I think twice before I go to an art event because it’s still time away from my studio. It’s fine to have your alone time, but I want to encourage all of you to get out of your studios and go visit with other artists whenever you can! Local art events offer an easy way to visit many studios in a short period of time, so that would be a good place to start. We just had a big one here in Oregon, called Portland Open Studios, and I was happy to visit with a number of artists I’ve never met before as well as those I try to visit regularly. I often post photos from my studio visits on my Facebook timeline. Great news! 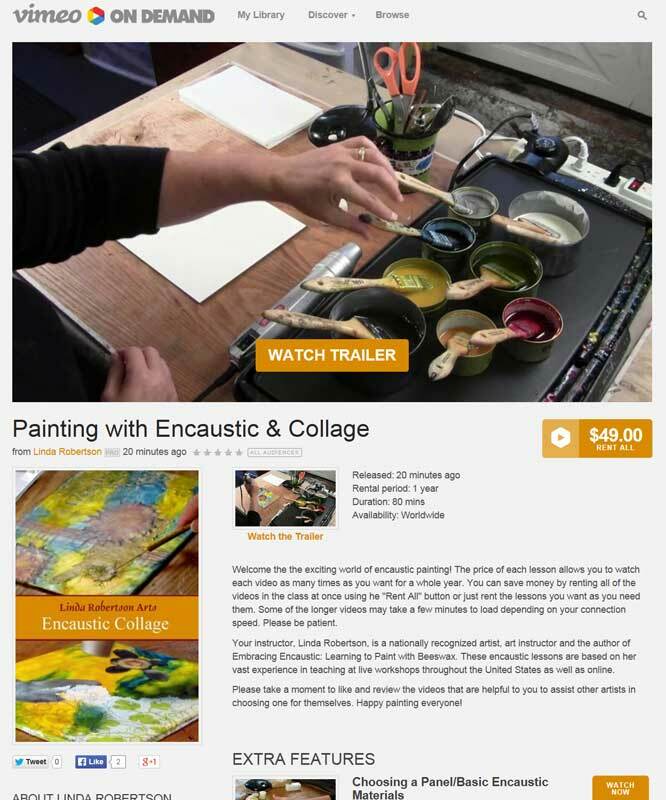 My online encaustic classes are now available by the class or by the lesson, allowing you to purchase exactly what you need. A few lessons are as little as $5 and each class page has at least one free bonus video. Are you new to encaustic? Not a problem! You should know that encaustic is one of the oldest forms of painting, with paint made from pure pigment mixed with beeswax and resin. The mixture is applied hot, and then reheated to fuse the layers together. It’s one of the most forgiving mediums available, allowing you to “undo” virtually anything, giving you the freedom to be fearless and let your creativity flow. My online encaustic classes will get you started working in this beautiful and unique medium in no time. If you are anywhere near Portland, Oregon be sure to stop by Peoples Art of Portland Gallery to see a wonderful encaustic and mixed media show with with a very personal connection to me. Each of these talented artists was once a student of mine! Don’t miss a chance to hear them talk about their wonderful new work too. Artists: Fredrick Swan, Kindra Crick, Karl Kaiser and Brian Gray. Hosted by Chris Haberman. Come talk with Portland artists who create layered work of evocative depths, using encaustic as part of their painting process. Discover how these artists cut, scrape and carve to reveal complex and textured histories. 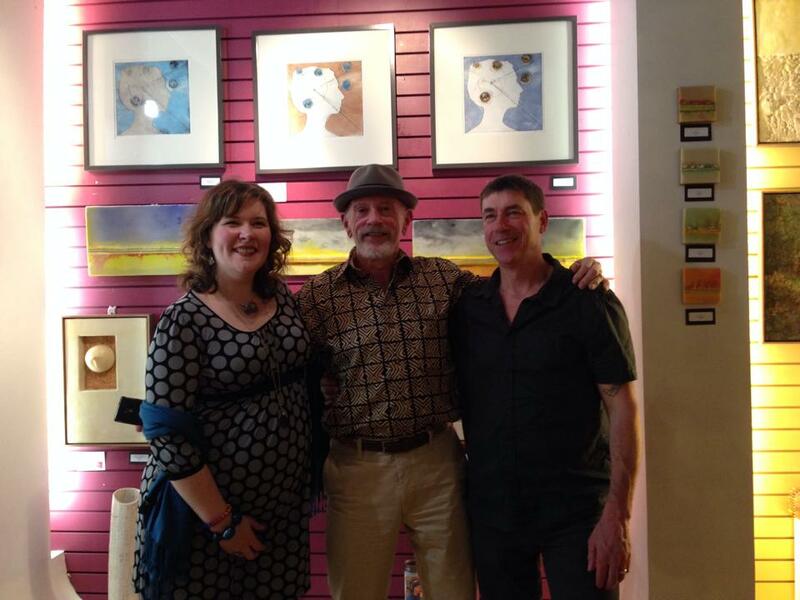 Kindra Crick, Karl Kaiser and Fredrick Swan will share their life experiences with art, unique and fascinating process to create depth and their formula for their work composed for the gallery, in their layered and exciting show, “Excavations.” This is not to be missed! Linda Robertson offers encaustic workshops in her Portland, Oregon studio as well as online encaustic classes at RobertsonWorkshops.com. Last week I had the pleasure of working with a wonderful people and pet photographer, Pauline Zonneveld, who booked time with me for a private consulting session to bring her vision of pairing encaustic and photography to life. She did her homework and brought a variety of images she liked cut out from magazines. This gave us a good basis to start with and from there I helped Pauline decide on a process and we talked about how to start developing her own distinctive style. I took Pauline through a couple of different ways to get a look similar to what she liked. She decided that image transfers would be the best route for her based on the equipment she already has, so we got to work. Here’s what she came up with. This photo was taken right after Pauline did a great little dance saying “Yes, that’s exactly what I wanted!” Well done Pauline! My August sessions are already booked but if you’d like to work with me in September or later check my website for ideas of what you might want to cover and how to register. This is ideal for artists who can’t make it to my regular workshops or those visiting the area who need to work within a specific schedule. BTW, Pauline is the photographer who took these amazing images of my 12 year old lab Sadie for her inspiring Good Old Dog Project. This weekend I attended the International Encaustic Artists annual conference called encaustiCon, in San Antonio Texas. It was a wonderful event with lectures, workshops, networking events and a great vendor room. I highly recommend it! A highlight of the event was their banquet which included presentation of the first annual La Vendéenne awards, where I was thrilled to win a trophy in the Media category. Awards were presented in several categories, and here are the winners! The jurors for the award included Gail Stavitsky, Chief Curator of the Montclair Art Museum (NJ), Paula Owen, President & CEO of the Southwest School of Art (TX) and David S. Rubin, Curator of Contemporary Art at The Brown Foundation (TX). The beautiful trophy was crafted by James Meyer, an extremely generous and gifted artist and studio assistant to Jasper Johns. I have to admit, part of me wants to press the trophy into wax. Is that wrong? Passion Spares Nothing, 11 x 14, encaustic by Linda Womack, featured in Dr. Stavitsky’s slide show at encaustiCon. As happy as I was to win the award, I was equally thrilled to see my work appear during the keynote speech, in Dr. Stavitsky’s slide show about contemporary encaustic work. You may recognize her name from the groundbreaking exhibition she curated in 1999 called Waxing Poetic, Encaustic Art in America. Waxing Poetic featured more than fifty artists whose content, style and subject matter differed widely but whose medium of choice was the same, wax. That show was the first introduction to encaustic for many gallery owners, reviewers and other artists. The International Encaustic Artists 2013 encaustiCon, will be held in Santa Fe, New Mexico, at the Eldorado Hotel from Oct. 31st ~ Nov. 3rd, 2013. Will I see you there? I’m proud to have an article in the current issue of Encaustic Arts Magazine called “Creating and Embracing New Opportunities” which tells the story of how my book, Embracing Encaustic, led to many more new opportunities including my online encaustic classes at RobertsonWorkshops.com. Read the whole article online. It’s a very inspiring magazine, so please share it with your friends! RobertsonWorkshops.com online video classes bring Linda Robertson, an art teacher with international experience, right into your studio. Work at your own pace and watch the videos as many times as you want for a whole year. There are now two books under the Embracing Encaustic title, Learning to Paint with Beeswax and the new title Advanced Techniques for Mixing Media, each focusing on specific encaustic techniques. Between the two books there are a total of 70 artists who share their work, reveal their personal painting methods and explain why they are compelled to make the work they do.Find out more and purchase them online here.